Some gardeners tend to hide their bin, but for me it’s a source of pride. 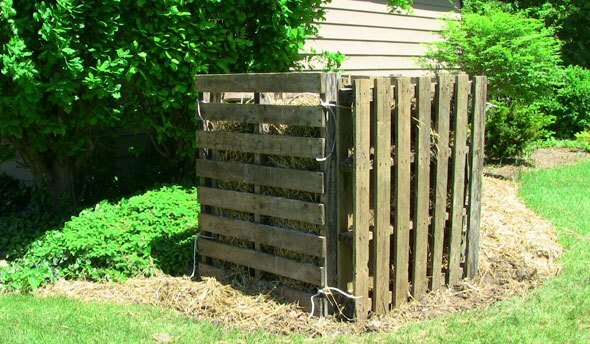 Composting at home is easy if you remember these 4 factors when building your DIY compost pile. Of course, I’m using organic composting methods here, so no chemicals. Oxygen is important because we’re doing aerobic garden composting. There are two basic methods to ensure there’s enough air, and you can use either or both. The first is to put a layer of brush, branches and sticks on the ground under the pile that is at least a few inches high. The second method is to turn the pile over once in a while. For the fastest decomposition, this is done whenever the pile starts to cool down from it’s hot phase, usually every 3-7 days. Even turning a compost pile once each season is helpful. In fact, when I’m not in a hurry, this is what I do when composting at home because while an unturned or little-turned pile takes longer to finish, it retains more nutrients. The fastest way to get it done, however, is to turn it regularly. A “hot” compost pile can be largely done in 2-4 weeks. Most weed seeds and pathogens can be killed in this time. But a cool, slow garden composting process has big advantages, too. Not only does it retain many more nutrients, but research shows it’s more able to suppress disease, probably because more beneficial microbes survive the composting process, especially fungi. We can also allow the compost pile to go through a maturation phase, where it’s already looking like finished compost, but sits for another perhaps 6 weeks at a cooler temperature allowing many microbes to multiply. This curing time is vital when composting at home to make the best compost. Your DIY compost pile should be moist like a wrung-out sponge. This means when you take a fist full and squeeze it, it should feel wet but not drip water. This is somewhere between 30% and 70% moisture, with 50%-60% generally considered ideal. If the compost is too moist, it can turn anaerobic and promote the wrong microbes, as well as leach a lot of nutrients. If it’s not moist enough, decomposition will be very slow, but this is a better problem than too much moisture, which takes more effort to fix. If the compost pile gets too moist or if it starts to smell bad, you can take it apart, air it out, and then add more carbon materials when you put it back together. If it gets too dry, water it and perhaps apply more nitrogen materials. You may need to take it apart here, too, in order to get it sufficiently wet. Different studies have come up with different ideal temperatures when composting at home, but it’s generally agreed that 130-150F for several days is adequate for organic composting to kill weed seeds and pathogens. If you’re judging with your hand, it should be too hot in the pile to keep your hand there for long. Still, significant reductions in pathogens have happened when the compost pile never went above 104F. To get the higher temperature, the compost pile should be at least 3 by 3 by 3 feet as a bare minimum, and as much as 5 by 5 by 5 (although some people go as wide as 10 feet). For the most part, the more frequently a compost pile is turned, the hotter it tends to get and the hotter it stays, although the most important part of reaching high temperatures is the right amount of moisture, proper pile size, and balanced carbon to nitrogen ratio. When composting at home, if your pile has too much nitrogen, it may go anaerobic, create bad compost and smell awful. If the pile doesn’t heat up, you may need to add more nitrogen materials. The ideal carbon to nitrogen ratio of a new compost pile is somewhere between 25:1 and 30:1, by weight, not volume. The way to get this ratio is to use between 2 and 4 times as many ‘carbon’ materials as ‘nitrogen’ materials (update: these days I use more like equal parts carbon materials and nitrogen materials). By the end of the garden composting process, the ratio in the pile goes down to somewhere around 10:1 because carbon is released as carbon dioxide. Remember those 4 factors when composting at home and you will be on your way to mastering a beautiful organic composting process. Any questions about these 4 topics? Do you have any other interesting DIY compost tips you use when composting at home? What are carbon materials and what are nitrogen materials and do you water the pile every day or two? Good questions (if I covered everything, the article would be too long, sosome things get left out). Carbon materials are leaves, straw/hay,newspaper/cardboard, sawdust and wood chips. Nitrogen materials are manure,grass clippings, food scraps and urine. I water very well while I’m buildingthe pile and then after that, perhaps once/week. Wonderful article – jam packed with good tips for my compost pile this year. Thanks. Ya, you’ve go it. If the compost has decomposed anaerobically, it may be too toxic for the worms, too. I’ve been wanting to compost at home a long time ago to reduce waste materials in our house and pursue organic gardening but I’m afraid to the awful smell it can produce, thanks for the tips to avoid it. A pitchfork works great – much better than a shovel. ..my kids live in an apt in the city, where garbage collectors could hardly collect kitchen waste evryday how would i decompose our kitchen waste, we got no yard… our kitchen waste are always filled with worms, so odorous and we pour boiling water to kill those worms.. how will we decompose them when we only have plastic buckets? You could try to set up an indoor worm composting system, which I haven’t talked about yet on this blog. Or you could buy some bokashi, a fermented bran, to help control odors. Refering to your carbon to nitrogen ratio advice, is it relevant for Bokashi composting while living in an apartment and doing balcony gardening? Actually I really would need some advice in how to use Bokashi composting for container-balcony gardening…Thanks! Well the bokashi that comes out of the kitchen isn’t really compost. It’s just food scraps that have been fermented a little bit, which helps them break down faster in the soil. Perhaps you should start a worm bin and add the bokashi to that. I loved your article! Something I also find helpful is to add a ground up yarrow leaf occasionally. It almost magically speeds up the process. Happy gardening! Oh, that’s interesting Sandy. Certainly I’ve used yarrow as a very beneficial plant in the garden, but hadn’t heard of it as a compost accelerator. I’ll try it out this year for sure. hey I am from India and I use this three tiered terracota pot for aerobic composting 🙂 its awesome and I love my daily routine of dumping my kitchen waste! Sticks will generally take years to compost, but they do promote a little more air in your pile, so they’re not a bad thing. If you’re using the compost in the garden, you may just use the sticks, too. If you’re using it in the lawn or for planting/seeding, you can strain the sticks out with hardware cloth.Too many leaves in a compost pile will mean the compost will take longer to finish. That’s not inherently a bad thing, but if you want compost done in a few months, be sure to match those leaves with some nitrogen-containing materials like fresh grass clippings or manure. Ideally, you would mix them with nitrogen-rich materials and compost them for a couple of years. They could be used as a mulch in your ornamental beds, but they may cause nitrogen deficiency for a few years. You can offset much of this by working compost and organic nitrogen fertilizer into the soil. I am starting a green bean garden hoping to offset my income with something I totally enjoy. This year my plot is 20×40 with 14 rows 15 ft long. Tomatoes are planted at the end of each. You have help me save time and money with just 3 lessons can’t wait for more! So very interesting to me thanks Tom M.
Sounds like fun. Glad to have helped. My chef and I are looking to compost on the roof of a hotel we are working at. We have tons of scraps in our kitchen and want to use those to compost for the roof top garden. we plan on having multiple compost piles at once in rotation. How would you recommend we start the project and what are the best food scraps to use? Hi Jessica, sounds like a fun project. You can use pretty much all scraps. Just don’t dump much oil in there. Even meat and dairy can be used, although it can attract rodents.As for how to start the project, that’s unfortunately too big of a question to answer here, but I have a couple of composting articles on this site, which you can find through the search in the top right corner.